An artist thrives to create splendid artworks. But what\'s the use of an art if people don\'t see it. And if no one sees an art, how will anyone buy it. Artwork being not sold is one of the greatest fears of an artist. 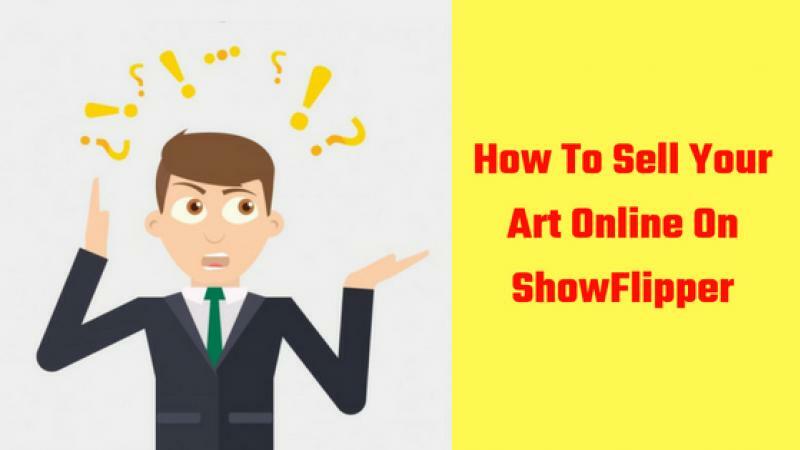 That\'s why, we are going to guide you about \"How to Sell Your Art Online\" on Showflipper. In case you do not know, ShowFlipper is an online art studio and an artist management company. It is a large online community of emerging and amateur artists, painters, knitters, sculptors, authors, poets & photographers from more than 53 countries. Lets now proceed to see how to make money online by selling art. First of all, you will have to create a profile on ShowFlipper as an artist. If you have not joined ShowFlipper yet, we suggest you do it now. By becoming a premium member of ShowFlipper, you will be able to sell your art online effortlessly as well as enjoy plenty of benefits. This is a very important step to attract the attention of target audience and traffic. An artist\'s statement explains the approach to the artwork, clarifies your position, and explains your value and belief systems to your target audience and probable buyers. Complete product description helps your buyers understand the type of materials used to create a composition. This increases the probability of the artwork getting sold quickly. The main tip on how to sell your art online is through social media. Everyone is on social media; create your social media profiles on Facebook, Google Plus, and Twitter. Share your ShowFlipper profile URL with your network. Share the URL in FB Groups and on FB Pages. Join Google Plus communities and follow other artists and art influencers on Twitter. Invite them to your profile. Trust me, this will help you a lot. Another good way to drive traffic to your art is through emails. Build your email list by interacting with fellow art collectors and artists through social media or through meeting people at social events, such as art exhibitions, art contests etc. Also, get in touch and start engaging your old clients. This way, not only your email list remains fresh, but also grows. Paid and Remarketing Ads: Ads on social media and search engines help to drive targeted traffic. Setting up ad campaigns to drive traffic to your ShowFlipper profile will help you to sell art more efficiently. Video Marketing: Create videos for your artwork and upload them to Facebook and Youtube with links directing those who view your videos to your ShowFlipper profile. Create a blog for your artwork and share your ShowFlipper profile link on every blog post. This way, you can drive enormous traffic. Develop your own kind of brand value. Create a brand of your artwork. People remember brands and associate a certain degree of value. Selling digital art online has never been so rewarding. Digital channels are opening up newer markets for emerging and amateur creators to showcase their artwork alongside masters in the art business.